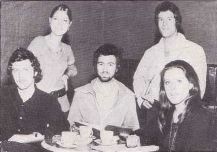 Meanwhile back at 7 Park Avenue, Bill had become involved with a young Welsh group called The Iveys. He was so convinced of their talent that he persuaded them all to leave Swansea and come to London, to live in the house at Golders Green. It was quite a squeeze – the Mojos members had a bedroom each; Bill had his own room which doubled as his office; another room was used as a mini recording studio, and The Kinks' road manager, Dave Duffield, lived there too. So The Iveys set up camp in the living room and from here they began their fateful foray into the music business as Badfinger. Following this experience, both The Mojos and, posthumously, Pete Ham of Badfinger, would later release recordings entitled 7 Park Avenue. There was just one drawback - Lewis had never read a play in his life, not even at school. "We didn't have a stage group. We never read plays because we'd only throw the books back at them.11 I'd never been to a theatre, not even to a musical. I was that ignorant. "2 So he went to a drama tutor, Barbara Francis, to study pieces from his first ever play, and auditioned at the London Academy of Music and Dramatic Arts (LAMDA) and at the Central School of Speech and Drama. Both auditions were successful, and he was offered a place by both schools, but he opted for the former, and in September 1968 Lewis began life as a drama student, embarking on LAMDA's Three Year Acting Course. His contemporaries included several other future stalwarts of British stage and screen, including Cheryl Campbell, David Suchet and Patricia Hodge. "I really didn't know what on Earth was going on as I was in with a crowd of folk who'd just left Cambridge." he said. "I had to re-educate myself completely. I used to go back to my grotty little room and literally break down because I couldn't make head nor tail of Shakespeare or anything like that. "35 But Lewis persevered, and during his time there he played many leading rôles from the classics. One day the pupils were asked to perform a Shakespearean speech of their own choice. When it was Lewis's turn, Patricia Hodge recalled, "We couldn't believe it when he bolted from his seat and out of the building. Somebody reported seeing him belt off towards the direction of the Earls Court Road. But actually he turned on his heel and ran back into the theatre and straight onto the stage and we all sat there riveted, thinking "What's he going to do?" And he went straight into this Romeo speech where Romeo is running for his life and it was wonderful, he'd set this whole thing up, giving it a bit of impact which none of the rest of us would have done and it was electrifying. "16 Lewis's individuality as an actor was also commented on in theatrical reviews, and at the end of the Course in 1971 he graduated with a LAMDA Diploma in Dramatic Art. Lewis had spent his student holidays hitching around the Mediterranean, but on graduating he visited New York, where he made many theatrical contacts. "I refused an 'easy' back door into Broadway." he later said. "I knew I was nowhere near ready for it, and commonsense told me that a solid grounding in British theatre would give me greater distance. Better to build on a good foundation. "20 So Lewis returned to Britain and joined Chesterfield Rep., learning the ropes as actor/assistant stage manager. "I swept the stage for my Equity Card.21 It was hard work but was worth it. "20 On 27th August 1971 he made his début as a professional actor playing a sentry in Strindberg's Dance of Death followed by three further appearances in productions by the Company during that season. In 1972, after another trip to America, Lewis joined Glasgow Citizens' Theatre, which he later described as "the best theatre in Britain for young talent. Where else do you get to play Tamburlaine at twenty-five? "20 He appeared in seven plays during his year there, including an appearance with the Company at the 1972 Edinburgh International Festival. After one performance at Citizens', a group of deaf children came backstage to meet the actors. Lewis was touched by their interest and began spending his days off teaching them drama. "A friend of mine in New York was deaf and I knew some sign language, but my task was really to get the children to speak without using their hands at all. I had trained at drama school in how to express yourself using your body, and I had been involved in theatre workshops, so this was all helpful.25 It was the most satisfying work I've done in my life. "29 At the end of the season the Citizens' Theatre director, Giles Havergal, was asked to go to a Canadian school to teach drama, and he invited Lewis to join him. Lewis agreed, and they both went off to an Indian Reservation in British Columbia. Apart from their flights and living costs, the project was entirely voluntary. On returning to Britain, Lewis joined The Royal Court Theatre and in September 1973 made his West End début in David Storey's The Farm, which would run until November. He also made a few private film appearances, performing in productions by students of the London Film School. Then, on 25th February, 1974, Lewis appeared in his first T.V. acting rôle, in the long-running police series Z-Cars. This was just the start, and he went on to make five more T.V. appearances that year, the most significant of which was They Disappear When You Lie Down, a T.V. play about a table-tennis team. Not only was this part responsible for helping Lewis get a starring rôle the following year, it also prompted his first fan letter. The busy T.V. schedule meant Lewis had time for only two theatrical Rôles that year, one of which was with Birmingham Repertory Company in their production of Blues Whites and Reds.